Nigeria president, Pres. 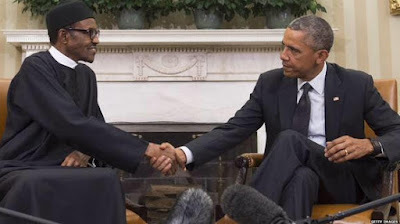 Buhari has accused America of aiding Boko Haram in their attacks because they refused to supply arms to Nigeria.He made this accusation while addressing members of the US Institute of Peace yesterday, July 22nd 2015. “In our efforts at combating the activities of Boko Haram, the new Government has sought and obtained the support of not only our neighbours other international friends and partners. Regrettably, the blanket application of the Leahy Law by the United States on the grounds of unproven allegations of human rights violations levelled against our forces has denied us access to appropriate strategic weapons to prosecute the war against the insurgents. Our forces have remained largely impotent because they do not possess the appropriate weapons and technology which they could have had, had the so-called human rights violations not been an obstacle.